Donald Trump is not a Conservative’s dream candidate, but he is giving Conservatives causes around which we can unite. That includes his picks for the Supreme Court. At the beginning of this month, I attended the Republican Party of Virginia’s convention in Harrisonburg, VA. As this article attests, Cruz wins most Virginia GOP at-large delegates (www.dailypress.com), the Republican Party’s rank and file supported Senator Ted Cruz’s candidacy for President. A week later, after Cruz had suspended his campaign, I attended the 1st District Convention of the Republican Party of Virginia in Fredericksburg. Again, the Cruz delegates won. The delegates who would have supported Cruz will attend the Republican Party’s Convention in Cleveland, OH (RNC Issues the Call of the 2016 Republican National Convention (www.gop.com)). Yet this time the delegates said they would support Donald Trump’s candidacy. Why? When the Republican Party selects the people it sends to the national convention, that process is controlled by conventions at the state level and at the congressional district level. Who goes to these conventions depends mainly upon who wants to go. What matters is caring enough to show up. Whereas many of Donald Trump’s supporters either did not either care enough or know enough to participate in the conventions, Ted Cruz’s supporters did. Cruz’s supporters, those sneaky fiends, showed up as the majority, and now they had a different choice. When the Virginia Republican Party decides who “Virginia’s” delegates to the Republican Party’s National Convention should vote for on the first ballot, a primary election and requires the “Virginia’s” delegates to vote based upon the primary results. Others have described the process. (Here is a reference => Everything you want to know about Virginia’s RNC delegate selection process (thebullelephant.com)). The problem with primaries is that people who don’t actively participate in the Republican Party can easily vote in a primary. If such people vote in large numbers in a primary, they can prevent the Republican Party’s rank and file from holding its nominees accountable for what the party stands for. Hence, because they interfere with our First Amendment rights to “peaceably to assemble, and to petition the Government for a redress of grievances,” primaries should be banned. Instead, we could and should use runoff elections so that voters don’t feel that are throwing their vote away when they vote for a third-party candidate. So if Trump is not really a Republican, why should Republicans support him? In spite of all his whining and immature name calling, Trump played by the rules, and he won the nomination. He is effectively the Republican Party’s nominee, and the only viable alternative (the only other candidate with a chance of winning) will be the Democratic Party’s nominee. Whereas voting for Trump may force us to hold our nose, voting for the Democratic Party’s nominee may require an awkward explanation at the Final Judgement. That is, Trump is not nearly as bad as the alternative. Further, there is some possibility Conservatives actually have something to gain if we support Trump, and he is elected. From the beginning of his campaign, Trump has sought the support of Social Conservatives (see Trump’s inroads with social conservatives). Whether Trump is a sincere Christian is anybody’s guess. Nevertheless, Trump has demonstrated he wants the support of Social Conservatives. Hence, we can expect he will fight for religious freedom as well as Pro-Life judges. In his book (see CAN DONALD TRUMP DELIVER ON HIS PROMISES? ), Trump indicates he supports school choice and restraining the wild environmental activism of the EPA. Of course, Trump has made a commitment to do something about illegal immigration. Unfortunately, Trump has no record as a politician. We know he is a good businessman (only four bankruptcies), a successful actor on reality TV (He fires people. ), and that he has contributed lots of money to politicians, including those he now complains about. Hence, the man is something of an enigma, not giving us much reason to campaign for him with wild enthusiasm. Still, given the alternative we can righteously campaign for him. At the same time, we can also work to get as many solid Conservatives in Congress as we can. Never forget, if it should to use it, Congress is still the most powerful branch of the Federal Government. In 2008, I wrote this post, CONGRESS: WHERE THE WEIGHT OF POWER RESIDES. Subsequently, Barack Hussein Obama became our president, the the Democratic Party dominated both houses of Congress. The result has been disastrous for our republic and our children. Every two years we elect Congress and one-third of the Senate, and this is one of those years. We cannot just focus on the presidential election. We must also elect the best Congress we can. Anyway, check out Donald J. Trump’s website => https://www.donaldjtrump.com/. Trump may not be our dream candidate, but there are still things to like. BIG BROTHER WANTS A BUREAUCRAT? Have you read Trump’s book Crippled America? Available at Amazon. I couldn’t fail but notice, that Trump got the pronunciation of Stras, Gruender, Colloton, Willet and Eid wrong. Same thing with Tanzania in his foreign policy speech, the one so important he used a teleprompter. I take this as indicative of the effort he put into vetting the people on his list and in understanding his own foreign policy. Do you think, Japan ought to get its own nuclear weapons? Do you think, South Korea should pay for America’s protection? If so, unite under Trump. So why Trump? I think I have explained, but since I like them, I think I will borrow a friend’s words. I’d swap Trump for a dog and shoot the dog. The only possible reason to vote for the presidency of this man, assuming he becomes our nominee, is the grim realization that the alternatives are worse. There is a lot of focus on the Supreme Court nominees, and that’s a big point. His list de jure are of course his suggestions du jour; he has already provided some wiggle room. But the Republicans may retain some power, and they may react more vigorously to Trump than they would to Clinton. I played Zork. Old, I guess. When the grue got you, you were gone. Just gone. Your are no grue. Gruesome, perhaps. Anyway, if you have a better suggestion, I will consider it. Who should I vote for instead of Trump and why? *chuckle* While that’s not his moniker in the LiveJournal environment, I’d wager that he was entirely familiar with “grues.” Perhaps having chosen the name of another when posting online should not be the focus of too much attention. Sometimes you don’t share every attribute with the real or fictional namesake. Paine, for example, was not just a non-theist, he was pretty hostile about it. It was for other attributes and history that led to his choice, and I agree with it. Bluegrue (unless I am mistaken and someone else has that moniker) has been here before, linked here from my LJ. The topic, that time, was global warming. This one, though, seems a bit abstruse to me. It’s not just that pointing out a couple of unlikable points about Trump would be expected to change the situation; you and I agree that there are a LOT of things to dislike about Trump’s policies, his decisions, his history, and his character. So the idea that he would have you logically “trapped” by this gambit and forced to change your plans seems silly to me. The only thing that makes Trump “attractive” (hardly the right word for it) despite his many faults collected and categorized all over the Internet is the fact that, amazingly, his opponent Clinton manages to be even worse. And worse in ways that could have long-lasting effects. But the commenter, were he to live in the US, would have no problem voting for her, I think. His sentiments generally align well with US leftists, though the European conventions of “left” and “right” don’t exactly line up with the US counterparts. It would have been interesting to see how bluegrue defended his choice of H. Clinton. It has gotten rather strange. I don’t verbally abuse people — at least not too much — but I almost never get a visit by anyone advocating a Democrat. I just get some people attacking Trump. A few attacked Ted Cruz. Mostly the rare Democrat just comes by to defend Socialism. It seems they cannot get it through their heads that Socialism is helping to corrupt our leaders. Amusingly, he’d seen that comment before. He’s a friend and regular reader — sort of the “loyal opposition” especially to my posts about the catastrophism faith behind global warming. He is pointed in his responses, but not intentionally hostile; English is not his first language, though he handles it very well indeed for all of that. And I am unable to edit the comment to fix the typo: It was supposed to be “du jour” for the second usage. Hi Tom, greetings from the GUE. As Keith called it, I mistakenly posted with my other handle, which I use outside my LJ / Crosstime Cafe environment. Sorry for the confusion. My trouble with Trump is that – from my point of view – there is no “there” there. He is very good at rattling down talking points and relating with the audience, other than that I do not really see much. He flounders as soon as he is being pushed beyond reguriating talking points, see e.g. the hostile Chris Matthews interview, in which Trump called for punishment for women who have an abortion, only to paddle back two days later claiming “I’ve been told by some people that was an older line answer and that was an answer that was given on a, you know, basis of an older line from years ago on a very conservative basis.” He crumbles under any sort of scrutiny. Sanders is similar to Trump in his appeal to his followers and in him crumbling in hostile interviews, where talking points are questioned, but I’ll focus on Trump for this comment. What your people decides to do to itself is your decision, not mine to take. What terrifies me (and I do not choose that word lightly) is the prospect of a man like Trump at the desk of the Oval Office, within reach of the BIG RED BUTTON, and the havok he can wreak on international relations. He’s floating the idea of defaulting on the US debt, which would send shockwaves through the global economy. He’s suggesting that allies should pay for the military protection the US offers, as if it were a mercenary force. How long, do you think, the US will be able to keep/gain allies in Asia, the Middle East or Africa. And Trump gives no indication whatsoever to have the slightest understanding of what the consequences of such moves would be. And I am talking long term damage to the US and the world here. As for you, I do not have good advice. From my point of view, Clinton is the only adult left in the room, sorry. The only thing I can think of is to vote down ballott for the House, Senate and State candidates that align with your views and to try and keep the House and the Senate away from the Democrats. 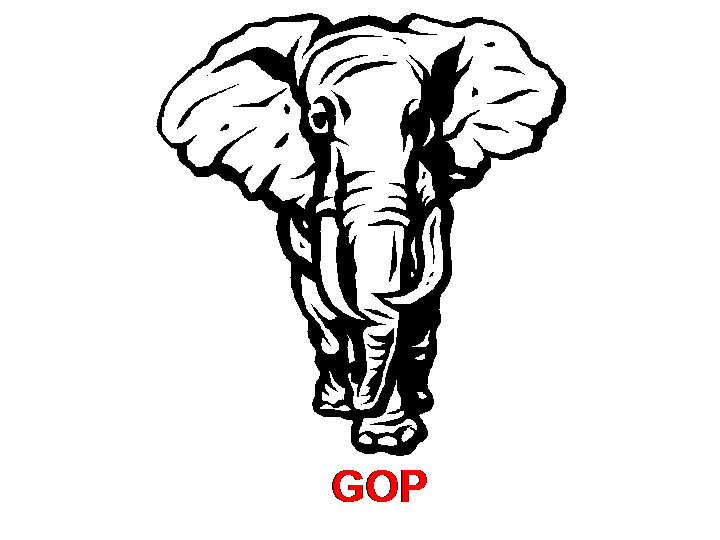 Use the four coming years to rethink and possibly revise the way the GOP picks its candidate. He is very good at rattling down talking points and relating with the audience, other than that I do not really see much. I don’t even give him this. He rattles out phrases, but is so inconsistent that these could hardly be called talking points. And his “relating with the audience” includes countless gaffes that would have ended the campaigns of anyone else. But Hillary Clinton as “the adult” — she is actively evil, Trump is just stupid and buffoonish. He might do more damage, accidentally, but perhaps he will learn on the job. Clinton knows the job, and her goals are basically Obama’s goals, but she will execute on them more forcefully. Ignorance grabbing for power frightens me. Ignorance has been grabbing for power most of human history. It is the norm. People have always busied themselves trying to run other people’s lives. Slavery never entirely ended, and it could get worse. I won’t steal material from my next post, but I suppose it is related. I will just address this line. From my point of view, Clinton is the only adult left in the room, sorry. Consider again how Keith responded. When someone is willfully evil, they are willfully ignorant. The Democratic Party is so determined to implement Socialism they are wrecking our republic trying to do it. I suppose most elected Democrats must know Socialism will not work, but all these geniuses care about is the power big government gives them. Yet even these Democrats are willfully ignorant. They ignore the fact that those who do evil ultimately find their behavior self-destructive. Is Trump stupid? That seems highly unlikely. The guy runs a large, successful business, but he has obviously found politics more difficult than he expected. He has also found his supporters more forgiving than he deserves. Why have Trump’s supporters been more forgiving than he deserves? I don’t know. Charisma, I suppose. I wonder if Trump even understands what his supporters like about him, but the fact he has backpedaled when he has said something that displeases them says he knows there limits. When it is needed, the man has enough sense to eat humble pie. Is Trump wise? That’s that question that truly matters, and I don’t know. I just think it is a cinch Hillary Clinton completely lacks the sort of wisdom we need in a president. Clinton’s record is atrocious. We don’t need a president wise in the ways of doing evil. We don’t need a president who is willfully ignorant of the destructive nature of the policies she would implement. Therefore, I will take my chances hoping Trump actually cares about my country. I will support Trump. BTW – Thanks for visiting again. No harm done with the bluegrue handle. If I used more than one, I would be getting them mixed up all the time. So I don’t. Thanks Citizen Tom for this advice. I am saddened by the state we are now in but not shocked and now am praying for direction not so much for the election of President but as you say for the next Congress and also how to live in the world we will soon find ourselves in. Thanks for your comment, and I hope others will add their prayers to your own. This election in my opinion is one of the simplest choices who to vote for based on statistics. The number one concern based on all polls is the economy. Whether a person is in poverty, middle class, or rich, there is more prospect to gain by voting Trump than Clinton. If a person is in poverty, and Clinton continues Obama policies, they will remain in poverty. If middle class, and the present statistics continue, there is a greater risk that real wages will continue to stagnate with a potential risk for their economic status to fall into poverty, especially if they are nearing retirement. If rich with lots of assets, statistics have shown, there is more potential for their wealth to increase when the poor or middle class have more money to spend. I am not certain I agree with your reasoning, but I agree with your choice, at least at this point. I presume that when you speak of the economy that you are looking for a tide that raises all boats. One of the things that is killing us is that our leaders are dividing us. One of the ways they do that is by redistributing the wealth. That is stealing, but it benefits some people at the expense of others, and it is deadly to the economy. If you are supporting Trump because you hope he will act in his own self interest, please don’t bother. If the man has no honor — just wants to grow rich — he will line his pockets by abusing his power. Look at most the folks in Congress. There are plenty of rich people there, and the richest are Democrats. If we want Trump to do the right thing, we will have to stay on his case. Given his history, I expect the only thing that will sway him is the feeling his supporters will hold him accountable. Given how well we have held the Majority Leader in the Senate accountable, I hope Trump has more honor than I suspect. We are not good at holding our leaders accountable. Trump is 70 years old and may have aspirations to do his part to give back to his nation.
. However, I believe that he may also be thinking of what will happen to his holdings when he passes on. Most of his holdings are real estate and will be subject to a huge inheritance tax burden. When your assets are in real estate, it is tough to hide in secret foreign accounts, secret holdings, or multi billion dollar life insurance policies, etc. I predict he will push to end the inheritance taxes once his other programs or ideas begin to have positive economic effects in the USA. Inheritance tax burdens are the biggest reason family farms get bought up by big money investors,, mainly foreign owners. When a family farm owner passes away, his heirs do not have the money to pay the inheritance taxes. The travesty is that when foreign investors buy the farmland under an investment or corporate entity, they never die and the result they never have to pay inheritance taxes like the small family farmer. Good point. I agree and to add to your observation, this old wise saying may perhaps also apply. “A fool and his money are soon parted.”. Agree with the saying. Not sure how it will apply to Trump. All I know is that we, the people of the USA, are getting poorer. I wrote this question statement in a previous post how to discern a fool if they were born rich and/or inherited wealth. Did they add to their wealth or squander it. Trump certainly added to his inheritance which is a good indication that he is no fool. He also is no politician, but that seems to be his strength and timing. Any fool can become a politician in my opinion. We seem to have plenty in evidence. Both Trump and Clinton are extraordinarily wealthy compared with the average citizen. If a criterion for casting a vote is whether a candidate is wealthier than an opponent and thus will gain more from sound economic policies, we might as well just give the job to Bill Gates or Warren Buffett and then crawl back into our stygian sweatshop holes. I think we need a better measure than this. Your “enigma” is my loose cannon, my giant question mark, my hypocrite opportunist. I hear all over that we had better vote Trump because he will put conservative judges on the court, (and if Hillary puts judges on the court, life on earth is over) but I believe that is an unfounded and largely unexamined premise. A wish. We have no evidence to believe that at all. In fact there’s plenty of reason, given his political history and his by-the-seat-of-his-pants style, to believe that he will tick his finger in the wind and put forward cronies and left-leaners. Even our most conservative presidents have put judges on the court who turned out to be not-so-conservative after all…Trump is some kind of genius who’s going to do better?! Well, you are living up to your name. First and foremost, please vote as your judgement and conscience dictates. All I am doing is offering my opinion, for what it is worth. I cannot predict what Trump will do. Even Trump won’t know until he has to make a decision. Do I have some naive hope that Trump will grow in office, that on the day he is sworn in he will suddenly realize he must behave as a God-fearing man? No. I just expect Trump to behave like most proud and ambitious men. He will realize he can get away with some lies, but he cannot behave in such a fashion that he loses his core support. Then he becomes impeachable, and much of the Washington establishment is already eager to impeach him. Trump has given us a list of his picks for the Supreme Court. He knows that those who would be his core supporters will demand that he choose on of those Conservative judges. So his first appointment must come from that list. His second? If he wants to run for president a second time, he had better make some decent Supreme Court picks. George W. Bush had a similar problem. Alito worked out. Roberts surprised everyone. For all we know Roberts is being blackmailed. I’m “living up to my name?” Please explain? I am referring to “madblog.” I take that to mean mad as in angry. No offense intended, but you did not exactly hide your feelings about Trump. I must be angry if I disagree with you? My comment is not full of “feelings” any more than any of yours are, or your post. I thought I wrote something of substance there. Neither do I base my assessment of Mr. Trump’s fitness to be our president on my feelings. I wish I could say the same for all of his followers, yourself excepted of course. It would be an overstatement to say I enjoy disagreement, but I try to focus on the argument, not the character of the person making the argument. However, since you call yourself madblog, I thought you would be amused by the reference. Apparently, that is not true. Why do you use the handle madblog? Because my name is Madelyn and I have a blog…lame perhaps, but I didn’t want to be too too clever about it. I read your response, in turn, as a bit of an insult since I was disagreeing with your post…maybe I also leaped to a conclusion. I apologize. Maybe we do need those darn emoticons. Madelyn is a pretty name. Mad does not do it justice. Sorry I misunderstood. Mad has sometimes been my nickname, so I hear it as affectionate. I guess it can sound otherwise! I don’t think Donald Trump will address the critical problem facing America, which is the fatal destruction of the separation of powers in the federal government. Nevertheless, he has a crystal clear understanding of self-interest and hopefully he will guide the American government to path with serves our national best interest. That will at least retard the Progressive, progressive destruction of American society. I hope you are right. I am just hoping he does not make a bigger mess than H. Clinton would make. The “mess” has already been unleashed by President Obama. And like the disastrous Carter Administration of the late 1970’s (I was there), the entire world will never get over what President Obama has wrought. A President “The Donald” with his survival instincts, superb formal education and managerial prowess, may be just what the doctor ordered. On the other hand, a Hillary Administration would just be rocket fuel added to the fire. I appreciate this. Very sad but it is a reality. I am a conservative and not a Republican. In Texas, I am guessing the state will go for Trump so in the Electoral College we will be safe. If that is in question, I will vote for him. I’ve held my nose before but I am actually getting tired of having to do that. The last two elections had me doing that. As with Romney, I am sure that if Trump loses, conservatives will get blamed. So … I am with but all too reluctantly. Surely we can do better! I am afraid every election gives us an imperfect choice. It would have been better to have Ted Cruz on the ballot, but he is imperfect too. We get the choices we get because we get the leadership we deserve. All we can do to deserve better leadership is obey our Lord’s command to take up crosses and pray for our His help. Meanwhile, we must try to vote for the best candidate on the ballot. Otherwise, we are certain to get the worst.